Northumberland's best choice for health, beauty, and medicine. Need help? Contact us by phone, web, or visit us personally! At York Super Pharmacy, we pride ourselves on being able to offer our customers friendly, quality service in a caring environment. In keeping with Cobourg’s small town atmosphere, our customers are more than just customers; over the years, they’ve become our friends. 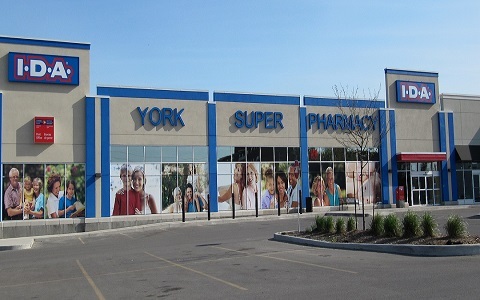 York Super Pharmacy was established in May of 1956 by Seymour Pepper, soon relocating the pharmacy from North York to the wonderful community of Cobourg. His two sons Dean and Jody joined the family business in the ‘70s after completing their studies. Since that time, much has changed in the pharmaceutical industry. Yet despite those changes, one thing that hasn’t changed at York Super Pharmacy is our dedication to personal service. That service has been enhanced with current state-of-the-art technology, enabling us to quickly track and accurately fill your prescriptions. In 2012, Dean and Jody embarked on a $2 million renovation that resulted in a brand new 12,000 square foot pharmacy. We now boast a number of improvements, such as spacious aisles, more efficient dispensary, a home health care centre, a private counselling room, a full service postal outlet, and a bright and inviting cosmetic area. Dean and Jody Pepper look forward to welcoming all past and future customers to our new York Super Pharmacy.